The interconnect line with zero degree tilt angle and having a Gaussian shape of edge- Hillock shows two different types evolution behavior depending upon the applied electron wind intensity. 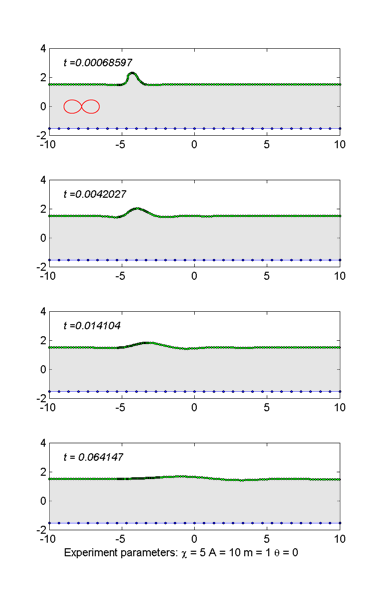 As can be seen in Figure, at very low current densities χ≤5 , the Hillock due time completely disappears leaving behind almost perfect flat surface. At low to high current densities, the situation is completely different. The top of the Hillock starts to over hangs on the leeward side. On the other hand, the lee side of the Hillock becomes more and more protruding deep into the bulk region, creating a bottle neck. The finally, the intruding part of the Hillock breaks down from the bottle neck portion becomes an interior wedge void. This newly created inner void, the size of which is somehow smaller higher the applied electron wind intensity, drifts towards the cathode end. The remaining part of the Hillock has still very long intrusion, which may act as a source for the multiple inner void generations by breaking-up.